Labor Day weekend in Door County brings some great weather so you can enjoy being outside for Sister Bay’s Marina Fest, the beautiful light and music at Woodwalk Gallery’s End of Season Music Festival, and take advantage of tons of opportunities to enjoy free live music with a great meal! Juniper’s Gin Joint in downtown Fish Creek – Juniper’s Menu is a Door County influenced Chicago Style Steak House. Imagine a classic American supper club influenced by Chef Neller’s unique flavor palate. She has created flavors using what Door County is so well known for (cherries, cheeses, junipers, Whitefish), and then added some creative touches. Late Night Live Music makes a drink after dinner especially enticing! 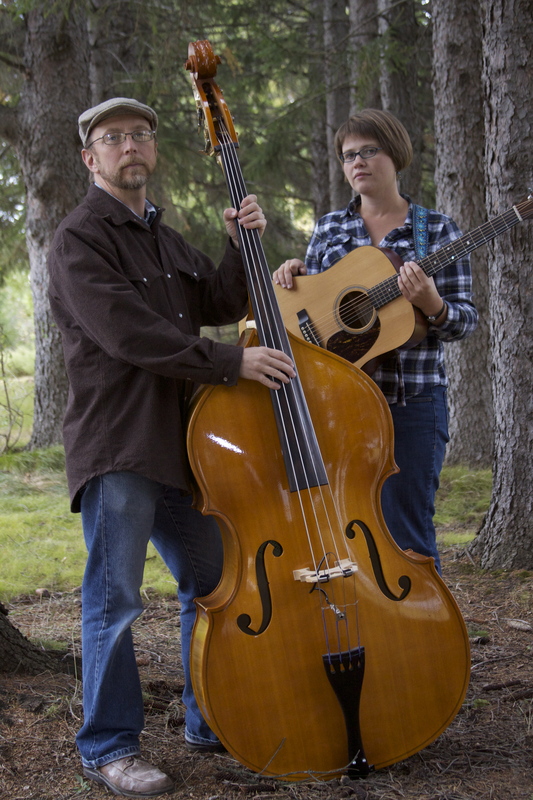 *Saturday, Sept. 5 – Marybeth Mattson performs outside in front of J. Jeffrey Taylor from 2-4pm (right across the street from Juniper’s Gin Joint). This local singer/songwriter welcomes diners to enjoy her music and encourages listeners to enjoy Juniper’s dining and outdoor seating. 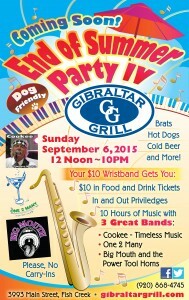 Gibraltar Grill on the north end of Fish Creek – With what has been called the Best Patio Bar and Outdoor Music Venue in Door County, Gibraltar Grill celebrates the end of summer in style! 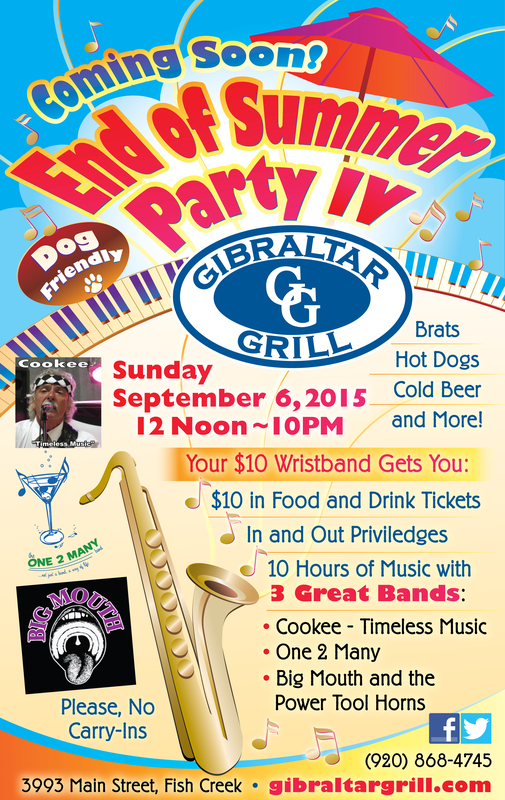 Live music Friday and Saturday night will be followed by the End of Summer Party IV will run from Noon until 10pm on Sunday, Sept. 6th. Admission is just $10 and your wristband gets you $10 in Food and Drink Tickets, In and Out privileges, and 10 hours of live music! Even the family dog is welcome to join the fun—well behaved and leashed at all times please! They’ll be serving up brats and hot dogs, cold beer, and more! The Cookery Restaurant & Wine Bar in downtown Fish Creek – Listen to live music in the Wine Bar while you enjoy dinner, wine and beer, and/or coffee and dessert from indoor or outdoor seating! Their menu offers American cuisine with a creative twist, and lots of homemade recipes featuring many local and in-season ingredients. Wickman House restaurant in Ellison Bay – Wickman House serves an out-of-this-world Sunday Brunch featuring Door County Farm Fresh Eggs, Buttermilk Pancakes, Biscuits and Gravy, and lots more, with local songbird Katie Dahl performing while you dine! Reservations accepted for parties of 6 or more. 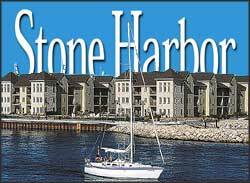 Stone Harbor Resort in downtown Sturgeon Bay – Enjoy live music on the patio at this waterfront resort. Rooms are still available with no minimum stay requirement for Labor Day weekend! 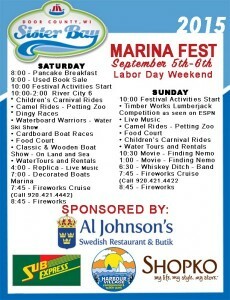 Sister Bay Marina Fest – September 5 & 6, 2015 – Enjoy Labor Day Weekend outdoors with live music, kids’ carnival rides, a petting zoo, dingy and cardboard boat races, a boat show, and the return of the Waterboard Warriors Water Ski Show. 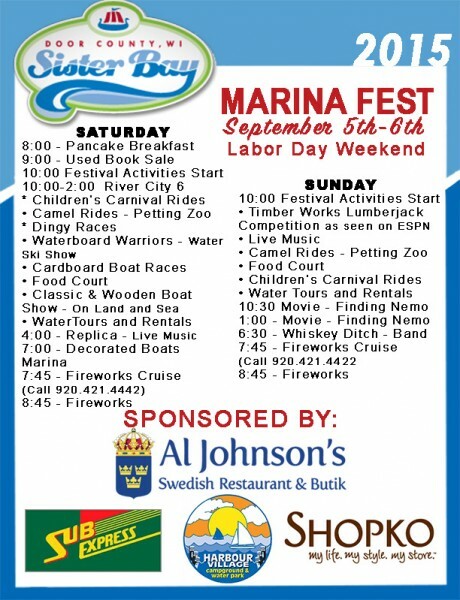 The Festival kicks off with a Pancake Breakfast at 8am on Saturday, Sept. 5th, and Marina Fest activities begin at 10am with live music from River City 6 until 2pm. Replica takes the stage with more live music at 4pm, and Fireworks will light up the shoreline at 8:45pm. On Sunday the fun continues with more live music, rides, tours and more, including showings of the animated movie Finding Nemo. Whiskey Ditch performs at 6:30pm, and another round of Fireworks wraps up the evening. For more information visit the Sister Bay Marina online. 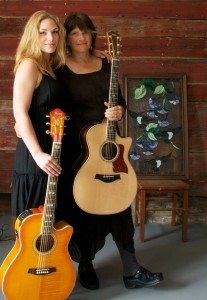 Jeanne Kuhns’ Woodwalk Concert Series – Season Finale Music Festival Week, Woodwalk Gallery, Egg Harbor. 3 Nights of Music Sept. 2-4. All Shows begin at 7pm. $20 at the door. BYO wine is welcome! Coffee, Soda, Beer, and Ice Cream treats will be for sale before and during each show. Concert goers are welcome to arrive as early as 5:30 to picnic before the show but must reserve tables ahead of time as limited tables are available. Call (920) 868-2912 for ticket and picnic table reservations. 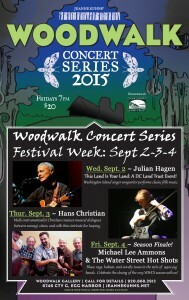 Wednesday, Sept. 2 – Julian Hagen at “This Land is Your Land” – A Door County Land Trust Event Night. This Washington Island singer songwriter performs classic Door County folk music that is heartwarming and delightful, infused with an unmistakable sense of humor. Thursday, Sept. 3 – Hans Christian in Concert. This multi-instrumentalist creates dialogues with sarangi and sitara answering each other and swooping cello sitting in opposition, in layers of musical voices through live looping. Friday, Sept. 4 – Michael Lee Ammons & The Water Street Hot Shots in Concert. Experts at performing blues, rags, hokum, and novelty tunes in the style of the 1930s jug bands. 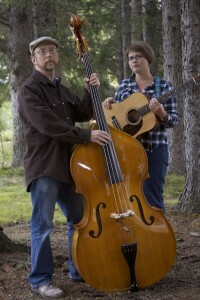 Celebrate the closing of the concert season with the vintage party music that this acoustic combo brings to the stage. For open rooms, suites, condos, and more in Door County, Wisconsin over Labor Day Weekend 2015, please visit Door County Lodging‘s Last Minute Lodging Blog and book your stay today!